Out of the most unseemly of circumstances comes a solution to solving the problem of gun control, the overbearing political adventures of the NRA and the high cost of ammunition and firearms in America. 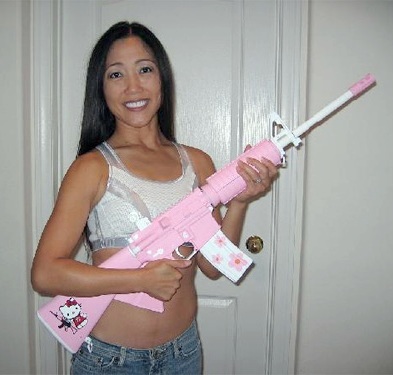 Proud owner of Chinese-made Hello Kitty assault rifle. Red China has introduced a whole line of guns aimed (in the non-shooting sense of the word) at the American gun consumer. The arms available, all pretty much cheap copies of already existing models, range from Derringer replicates to the ever-beloved assault rifles and machine guns. 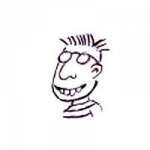 They are, not surprisingly, are of a lower quality than their original counterparts. Gun manufacturers, quickly realizing the blow these cheap firearms could make to their profits when hunters, home defenders and mass murders started buying the oriental knock-offs (in both senses of the word), worked quickly to get the National Rifle Association to pressure the US government to ban them. The government, apparently realizing how much they owed to the Chinese government and remembering the NRA President’s quote about them being “jack-booted government thugs,” refused to go with it. So the NRA, backed into a corner, put together an advertising assault, stating that “true Patriots would only buy American guns,” and displayed them on every television channel, high gloss magazine and strategically-placed bill board in the country. The majority of gun buying Americans, however, showed their true patriotism by continuing to buy the Chinese makes. Walmart, the supposedly most American of stores, promptly began stocking strictly Chinese makes, and showed record profits for the quarter. (Walmart then declared they were actually still American patriots, since making a profit is considered to be an All American virtue). Unfortunately for consumers, the guns were not exact copies of the originals in terms of their performance. Hunters had the cheap guns backfire, knocking them backwards and scaring off every deer for five miles around. Snipers had them flare upon firing, blinding them and causing them have to seek another profession. Miscalibrated barrels caused target shooters to hit the next guy’s target and sometimes the next guy himself. Mass murderers had their gun explode, killing themselves, thus short circuiting their plans to kill as many people as possible before offing themselves. After gun manufacturers stopped supporting them, the NRA was forced to disband. A new group, called Patriots for the Buying of Only American Guns, was formed to better represent them in efforts to fight gun control. Apparently, many in the upper echelon in the NRA could not handle this, and tried to take their own lives. But, some having also bought the cheap guns, killed those around them too, when the guns accidentally pumped out more than one bullet. Others have had to take jobs at Walmart, where they humiliatingly have to sell the very guns that put them out of a job. Gun control advocates, seeing the mayhem that was ensuing, decided to keep quiet and let the drama unfurl of its own accord. Unbeknownst to the American gun buying public, the Chinese have outfitted all guns sold to America with a chip that will make the gun stop functioning on April 1st, 2015 at 1:36 AM. The Chinese invasion will begin at 6:47 AM. An April Fool indeed!